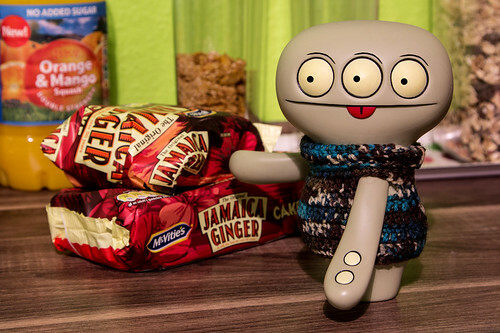 Uglyworld #1904 - Who Eatereds My Gingers Caker - (Project Cinko Time - Image 110-365), a photo by www.bazpics.com on Flickr. Whats the heller, yesterdays I leavereds 2 completelies full and unopenereds gingers cakers here in the kitchener, and when I checkereds on them tonights I findereds one of them has been half scoffereds!!! Normallies Babo woulds be to blamer, but he is still incarcimarateds, so I knows that it wasn't him!